For those who don’t know, musakhan is a popular and traditional Palestinian dish. It’s typically composed of fresh bread topped with tangy cooked sumac onions then layered with roasted spiced chicken. Often it is served with toasted nuts, parsley garnish, salad and/or yogurt. I’ve been meaning to make this dish for a while now, over a year to be exact. I wanted to put my own twist on it since I am gluten and dairy intolerant. Plus, I LOVE tacos. 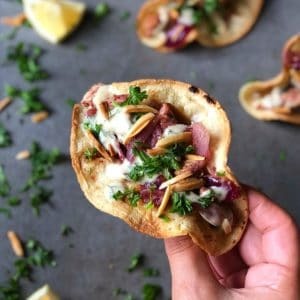 So, I combined the flavors and fundamentals of musakhan into a corn tortilla. Genius, right?! Hands down, one of the best tacos I ever had! There are 3 main components to my taco. You need to caramelize some sumac infused onions; you need to saute some chicken cubes in spices, and then make an herb tangy tahini sauce to freshen it all up. Add olive oil to a large skillet. Then add all the onions. Season with salt, pepper, cumin, and sumac. Cook the onions for about 15-20 minutes on medium heat till caramelized and soft. Place aside in a plate. In the same skillet that we cooked the onions. Add more olive oil then add the diced chicken. Season with garlic powder, allspice, paprika, lemon pepper, and salt. Cook for about 10-12 minutes on medium heat till chicken is cooked through. If there is excess liquid from cooking the chicken, drain it of the liquid. Then add back the onions and mix together. Squeeze with a little lemon juice over the top. Mix the above ingredients all together in a bowl. If too thick, add more water. If too thin, add more tahini. Taste to adjust as you like. 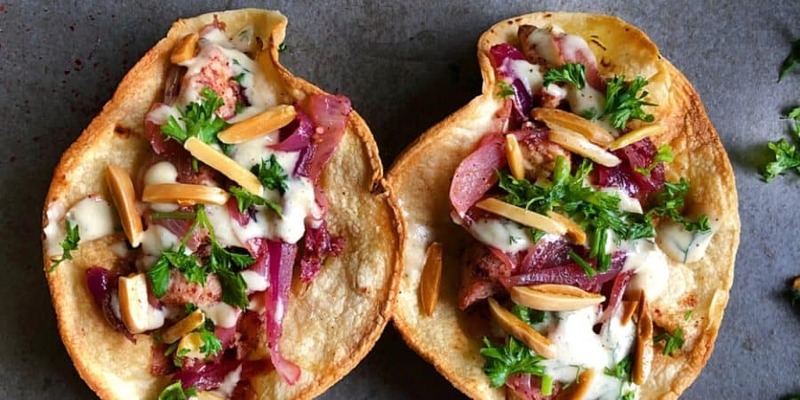 If gluten intolerant use either a soft or hard corn tortilla and layer with the chicken and onions then top with toasted slivered almonds or pine nuts as well as the tahini sauce and chopped parsley.